Survivors signed documents never to speak; Acevedo says now people "must know"
LOMA LINDA, California (CNN) -- Anthony Acevedo thumbs through the worn, yellowed pages of his diary emblazoned with the words "A Wartime Log" on its cover. It's a catalog of deaths and atrocities he says were carried out on U.S. soldiers held by Nazis at a slave labor camp during World War II -- a largely forgotten legacy of the war. Anthony Acevedo served as a medic during World War II. He was captured and sent into a Nazi forced labor camp. Acevedo pauses when he comes across a soldier with the last name of Vogel. "He died in my arms. He wouldn't eat. He didn't want to eat," says Acevedo, now 84 years old. "He said, 'I want to die! I want to die! I want to die!' "
He was one of 350 U.S. soldiers held at Berga an der Elster, a satellite camp of the Nazis' notorious Buchenwald concentration camp. The soldiers, working 12-hour days, were used by the German army to dig tunnels and hide equipment in the final weeks of the war. Less than half of the soldiers survived their captivity and a subsequent death march, he says. 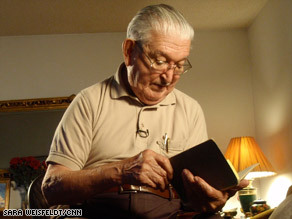 Acevedo shows few emotions as he scans the pages of his diary. But when he gets to one of his final entries, the decades of pent-up pain, the horror witnessed by a 20-year-old medic, are too much. "We were liberated today, April the 23, 1945," he reads. Acevedo's story is one that was never supposed to be told. "We had to sign an affidavit ... [saying] we never went through what we went through. We weren't supposed to say a word," he says. The U.S. Army Center of Military History provided CNN a copy of the document signed by soldiers at the camp before they were sent back home. "You must be particularly on your guard with persons representing the press," it says. "You must give no account of your experience in books, newspapers, periodicals, or in broadcasts or in lectures." The information was kept secret "to protect escape and evasion techniques and the names of personnel who helped POW escapees," said Frank Shirer, the chief archivist at the U.S. Army Center for Military History. Acevedo sees it differently. For a soldier who survived one of the worst atrocities of mankind, the military's reaction is still painful to accept. "My stomach turned to acid, and the government didn't care. They didn't give a hullabaloo." It took more than 50 years, he says, before he received 100 percent disability benefits from the U.S. Department of Veterans Affairs. Despite everything Acevedo endured during the war, little had prepared him for his own father's attitude toward his capture. "My dad told me I was a coward," he says. "I turned around and got my duffel bag, my luggage, and said, 'This is it, Father. I'm not coming back.' So I took the train the following day, and I didn't see my parents for years, because I didn't want to see them. I felt belittled." For decades, Acevedo followed the rules and kept his mouth shut. His four children didn't know the extent of his war experience. He says he felt stymied because of the document he signed. "You never gave it a thought because of that paper." Now, he says it's too important to be forgotten. In recent years, he's attended local high schools to tell his story to today's generation. "Let it be known," he says. "People have to know what happened." A Mexican-American, he was schooled in Pasadena, California, but couldn't attend the same classes as his white peers. "We couldn't mix with white people," he says. Both of his parents were deported to Mexico in 1937, and he went with them. Acevedo returned to the States when he was 17, he says, because he wanted to enlist in the U.S. Army. He received medical training in Illinois before being sent to the European theater. A corporal, he served as a medic for the 275th Infantry Regiment of the 70th Infantry Division. Acevedo was captured at the Battle of the Bulge after days of brutal firefights with Nazis who surrounded them. He recalls seeing another medic, Murray Pruzan, being gunned down. "When I saw him stretched out there in the snow, frozen," Acevedo says, shaking his head. "God, that's the only time I cried when I saw him. He was stretched out, just massacred by a machine gun with his Red Cross band." He pauses. "You see all of them dying out there in the fields. You have to build a thick wall." Acevedo was initially taken to a prison camp known as Stalag IX-B in Bad Orb, Germany, where thousands of American, French, Italian and Russian soldiers were held as prisoners of war. Acevedo's diary entry reads simply: "Was captured the 6th of January 1945." Jewish soldiers wearing Star of David necklaces began yanking them off, he says. About 90 Jewish soldiers and another 260 U.S. soldiers deemed "undesirables" -- those who "looked like Jews" -- were selected. Acevedo, who is not Jewish, was among them. They were told they were being sent to "a beautiful camp" with a theater and live shows. "It turned out to be the opposite," he says. "They put us on a train, and we traveled six days and six nights. It was a boxcar that would fit heads of cattle. They had us 80 to a boxcar. You couldn't squat. And there was little tiny windows that you could barely see through." Acevedo says he was one of six medics among the 350 U.S. soldiers at Berga. Political prisoners from other countries were held at Berga separate from the Americans. "We didn't mingle with them at all," he says, adding that the U.S. soldiers worked in the same tunnels as the other political prisoners. "We were all just thin as a rail." The U.S. prisoners, Acevedo says, were given 100 grams of bread per week made of redwood sawdust, ground glass and barley. Soup was made from cats and rats, he says. Eating dandelion leaves was considered a "gourmet meal." If soldiers tried to escape, they would be shot and killed. If they were captured alive, they would be executed with gunshots to their foreheads, Acevedo says. Wooden bullets, he says, were used to shatter the inside of their brains. Medics were always asked to fill the execution holes with wax, he says. "Prisoners were being murdered and tortured by the Nazis. Many of our men died, and I tried keeping track of who they were and how they died." The soldiers were forced to sleep naked, two to a bunk, with no blankets. As the days and weeks progressed, his diary catalogs it all. The names, prisoner numbers and causes of death are listed by the dozens in his diary. He felt it was his duty as a medic to keep track of everyone. "I'm glad I did it," he says. He and the other soldiers were once taken to what Acevedo believes was the main camp of Buchenwald, about 30 miles (48 kilometers) from Berga. They noticed large pipes coming from one building. "We thought we were going to be gassed when we were told to take our clothes off," he says. "We were scared. We were stripped." "Rumors were around that this was where the political prisoners would be suffocated with gas." It turned out to be a shower, the only time during their captivity they were allowed to bathe. The main Buchenwald camp was officially liberated on April 11, 1945. But the camp and its subcamps were emptied of tens of thousands of prisoners as American troops neared. The U.S. troops held at the Berga compound were no exception. "Very definite that we are moving away from here and on foot. This isn't very good for our sick men. No drinking water and no latrines," Acevedo wrote in his diary on April 4, 1945. He says they began a death march of 217 miles (349 kilometers) that would last three weeks. More than 300 U.S. soldiers were alive at the start of the march, he says; about 165 were left by the end, when they were finally liberated. Lines of political prisoners in front of them during the march caught the full brunt of angry Nazi soldiers. "We saw massacres of people being slaughtered off the highway. Women, children," he says. "You could see people of all ages, hanging on barbed wire." One of his diary entries exemplifies an extraordinary patriotism among soldiers, even as they were being marched to their deaths. "Bad news for us. President Roosevelt's death. We all felt bad about it. We held a prayer service for the repose of his soul," Acevedo wrote on April 13, 1945. It adds, "Burdeski died today." To this day, Acevedo still remembers that soldier. He wanted to perform a tracheotomy using his diary pen to save Burdeski, a 41-year-old father of six children. A German commander struck Acevedo in the jaw with a rifle when he asked. "I'll never forget," he says. On a recent day, about a dozen prisoners of war held during World War II and their liberators gathered at the Jerry L. Pettis Memorial Veterans Medical Center in Loma Linda, California. Many applauded Acevedo for his heroics. "Those of us in combat have our own heroes, and those are the medics. And that's Antonio. Thank you, Antonio," one of the men said. The men gathered there nodded their heads. Two stood to shake Acevedo's hand. "The people that are in this room really are an endangered species," another man said. "When they're gone, they're gone. ... That is why they should be honored and put in history for generations to come, because there are not that many of them left." Donald George sat next to Acevedo. The two were captured about a half-mile apart during the Battle of the Bulge. "It's hard to explain how it is to be sitting with a bunch of people that you know they've been through the same thing you've been through," George said. "Some of us want to talk about it, and some of us don't. Some of us want to cry about it once in a while, and some of us won't. But it's all there," he said. "We still like to come and be together a couple times a month," George added, before Acevedo finished his sentence: "To exchange what you are holding back inside." Acevedo says the world must never forget the atrocities of World War II and that for killing 6 million Jews, Hitler was the worst terrorist of all time. He doesn't want the world to ever slide backward. His message on this Veterans Day, he says, is never to hold animosity toward anybody. "You only live once. Let's keep trucking. If we don't do that, who's going to do it for us? We have to be happy. Why hate?" he says. "The world is full of hate, and yet they don't know what they want." CNN's Traci Tamura and John Torigoe contributed to this report.